Please book on-line. 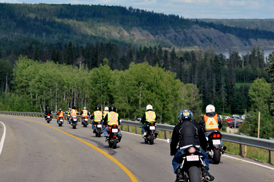 A deposit of $200 for motorcycle course is required to hold a spot. It is the student's responsibility to read and understand the cancellation policy. If you have questions please contact our office right away. No refund will be issued once a student's course has commenced under any circumstances. We understand that some emergencies make that impossible and may make allowance in such cases to help you finish the course when your schedule allows. By signing up for the course, you are in agreement with the cancellation policy. Although we do not cancel for rain, motorcycle courses in the early part of the season must occasionally be re-scheduled because of dangerous weather conditions. We realize this can disrupt your schedule (ours too) and we appreciate your understanding. Safety is our paramount concern. If we have to cancel because of weather, we'll do our best to reschedule according to what works for you. If you have any questions or concerns please feel free to contact us.